Thanks for stopping by today! If you've come from Catherine's blog, you're in the right place! Are you totally counting the hours until this SOA release? Cause if you're not....you totally need to be. Folks, if you purchase this SOA collection, you will never need another birthday or party stamp set ever again. Get on the waitlist here. So let's get right to the cards cause I'm sure you're already chomping at the bit to get the collection and you just want to see the cards! The first card today incorporates a favorite technique of mine--foiling! I used a CP stencil and applied transfer gel with a palette knife before running it through my laminator to create the colorful background. And I then used some surprise items from the collection along with some CP inks and and created the card panel by using the sentiments from Woo Hoo! stamp set in the SOA collection. I also filled in the background with smaller images. You can use these images in lots of different ways to fit whatever occasion you're needing a card for! You can trim down any stamped panel and put it on a background to kick things up a notch. The next card was inspired by the Pioneer Woman dishes line. Have you seen them???? They are just so beautiful and I want to buy all of them. 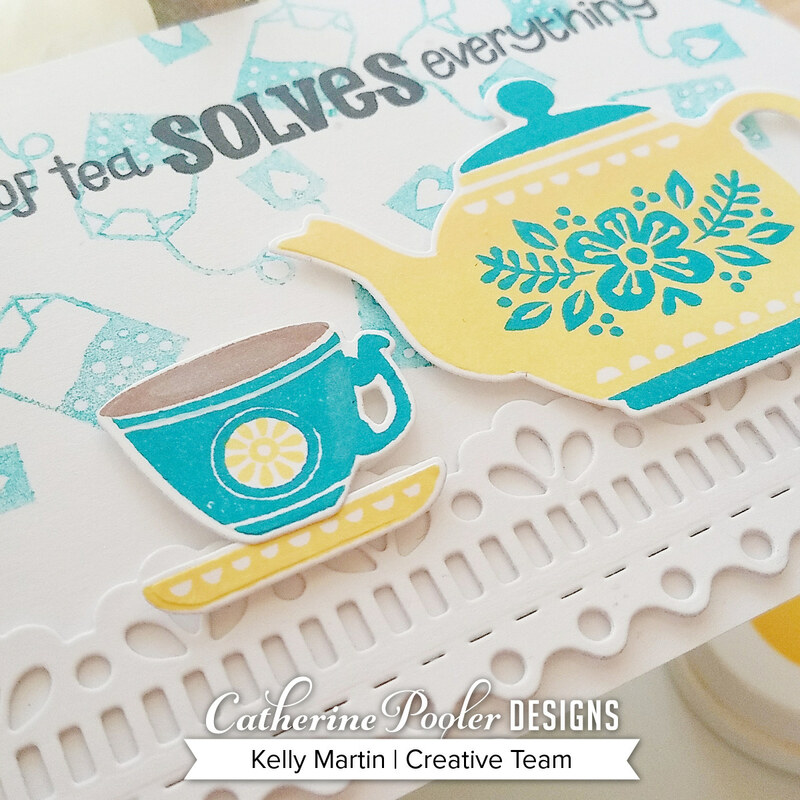 I wanted to make a bright and cheerful card because teapots are lovely and feminine, and that is totally my style! 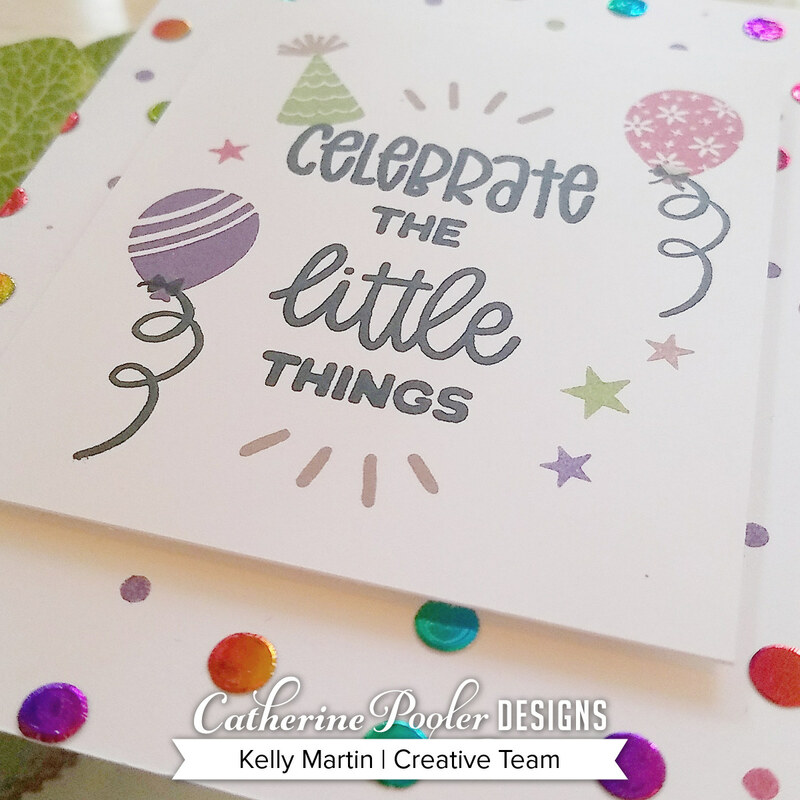 This stamp set is so versatile with all the different color schemes you can incorporate. I stamped out the images and then die cut them and set them aside. I cut a 4.25 in. 5.5 in. card panel and used a 2nd generation stamping technique to create the background. I then used the Bordering Sweet die to cut several layers of white cardstock and then adhered that on to the bottom of the card. To finish off the card, I put my teapot and teacup images on to the card by adhering foam tape on to the back of them, and that will help you make the image pop off the card! So let's get on to the good stuff! Comment on each stop of the blog hop for your chance to win a $97 certificate to the Catherine Pooler store! Winners will be announced on April 23rd at 6 PM on Catherine's blog. Thanks again for stopping by, and happy creating! The foiled dots are so pretty! The blue and yellow is a great combination on the tea pot. I like how you got inspiration from real dishware. Your designs make me feel even more excited to get my hands on this SOA box! Beautiful cards! Your foiled card is so festive! Wonderful ideas! Your cards are both sweet. I'm especially drawn to the blue and yellow teapot and teacup, my favorite color combination. Both of your cards are darling, but that teapot is so appealing (and I'm a coffee only drinker). Your cards make me want this SOA even more! Love your cards. The tea set card is so much fun and elegant. Great cards! 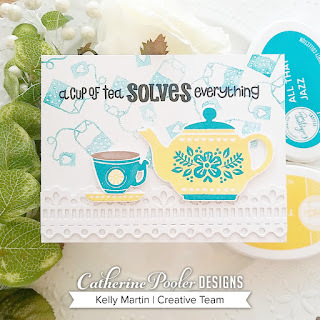 I really love the foiled dots and the tea card is so cute. I think that makes me re-think which stamp set I would choose. Maybe I'd need both!! I love the tea bags in the background. Love your cards! Love the foiled dots! Beautiful cards. I love the border edge on the tea card. Thanks for sharing. Lovely cards.. Love the multicolored background. This is going to be a great release! Hope I can get in on it! The foiling technique is beautiful. Your cards are so stunning, beautiful and very lovely!!! Oh how I love those teapots! Such sweet cards. I am going to need to invest in some foiling products because i love the effect on the scattered circles stencil. The teapot card is just lovely. I love both your cards. The color combo on the teacup card is great! Love these cards and the tea bags as a background....to cute! Both of your cards are wonderful but that second one...LOVE it. Such fun cards! As a tea drinker, I love the tea card! Such fun cards! The scattered dots and the balloons are definitely my favorites. Love those retro colors you used for your tea card. Bright and cheerful background! Love it! Wow, fantastic cards! One card fun and festive the other soft and sweet. Wow what a great card. Love the foil dots. I am going to try foiling here soon. Such a great idea. Love it. I love coffee but going to order both coffe and tea sets plus the dies. I can’t wait for tonight. I love you Ree inspired tea pot! I love her cheery stuff too. I want it all!! These are too cute! Such cheery design plans colors! Oops, Sent that last message to the wrong account. I love both cards. The foiling and the tea set which makes me want to sit with a friend and enjoy! Your first card is so playful and happy. The second is more elegant and refined. Love your ideas - great cards! Kelly your cards are amazing, love the background on your first card very pretty with all different colors. Thank you for sharing. Such beautiful cards~ Loving the celebrate little things. Wonderful cards especially like the tea card. I've got to use my transfer gel and laminator more often. Thank you for the inspiration!!! Blue and yellow are two of my favorite colors to combine too! Great cards. Absolutely love this must have stamp set. Thanks for your inspiration. Your cards are lovely and inspiring. I love the foiled polka dots. I love that teapot and cup card a lot. Thank you for the sharing the inspirations! Stunning cards! I love the designs and the colors used! Very cheerful and fun! Great cards. Really love the second one. Such a pretty colour combo and fun background. Super cute cards!! The party hats and balloons are cute!! Very lovely and cute cards. Love your backgrounds using the little stamps from the collection. Love both of your cards! The second one definitely has that Pioneer Woman vibe. Love her dishes too! Thanks for sharing! Oh, I love that second card so much! The happy flowers on the teapot and cup just make me smile. I also really like the rainbow foiling on the first card. That's very festive confetti. Thanks for sharing! Okay that's it...cup of tea card is by far my favorite!!! Cannot wait to get my hands on this delightful set! Your cards are just too cute. 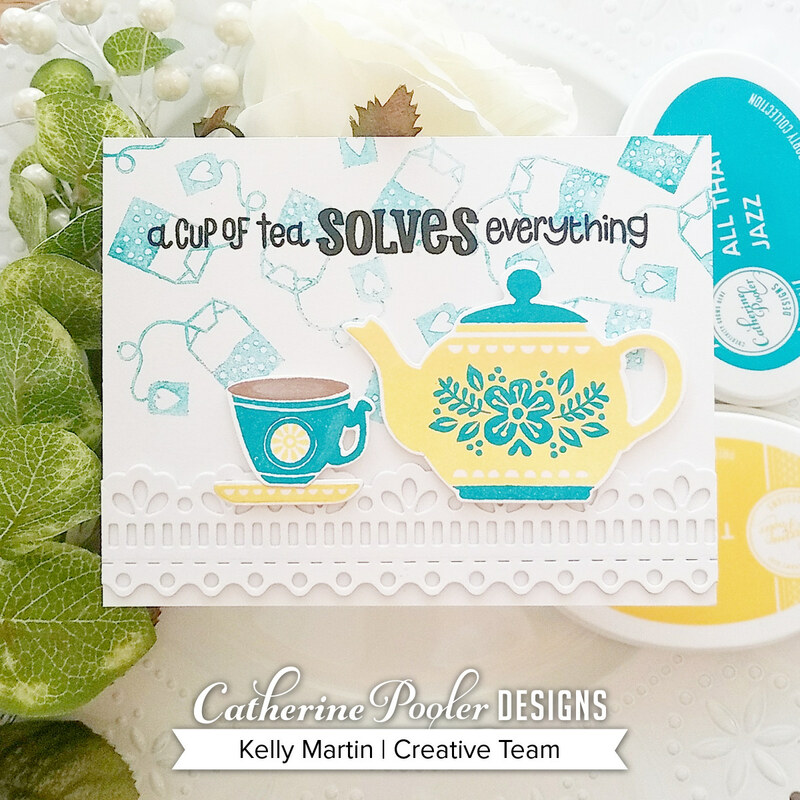 The colors you chose on your tea set card reminds me of my grandma's table cloth with her china tea pot and cups. Thanks for the memory. I absolutely love that cute little teapot! Adorable cards, what a fun SOA!! These are pretty! I love the color combo on that tea pot! Love the foil dot background on the first card. And tea is always amazing. The foiled dots are so cute! Love how you did both these backgrounds. And tea is always amazing. Time to start getting ready to be creative again! Love your cards! Delightful cards! I have not gotten into foiling yet, but I have a laminator from a long time ago so perhaps I should dig it out and try some? Using transfer gel and the laminator makes it SUPER easy! Love the foiled card! I have yet to do much foiling myself. I have the supplies just got to sit down and try. I'm really liking the tea stamp collection. Great job! Very pretty cards. I especially like the first one. I just love the polka dot stencil!! Can’t wait to use it!! I love your card great color combination! Got to have those polka dots! On the first card I love the colorful dots in the background and on the second card I love how you put the tea bags in the background. I Love both cards! So festive with the foiling on the first card and love the colors on the tea themed card. Love your cards! Can't wait to get my SOA! Love both of your cards! Really great. Thanks so much for sharing with us!! So cute - love the teapot and teacup. Love the background on your first card looks amazing. Your cards are so cute. I love the rainbow foiling on the celebrate one. Thanks for sharing. Super cute. I do like how much this kit can do! I love your foiling!! The foiling adds the glam WOW factor to your card.I like the contrast between the bright foiling and the muted Spa ink collection. TFS and being a part of Celebrate Friends blog hop. I like both cards. The dot stencil is stunning with the foiling. The teapot can be used different ways too. 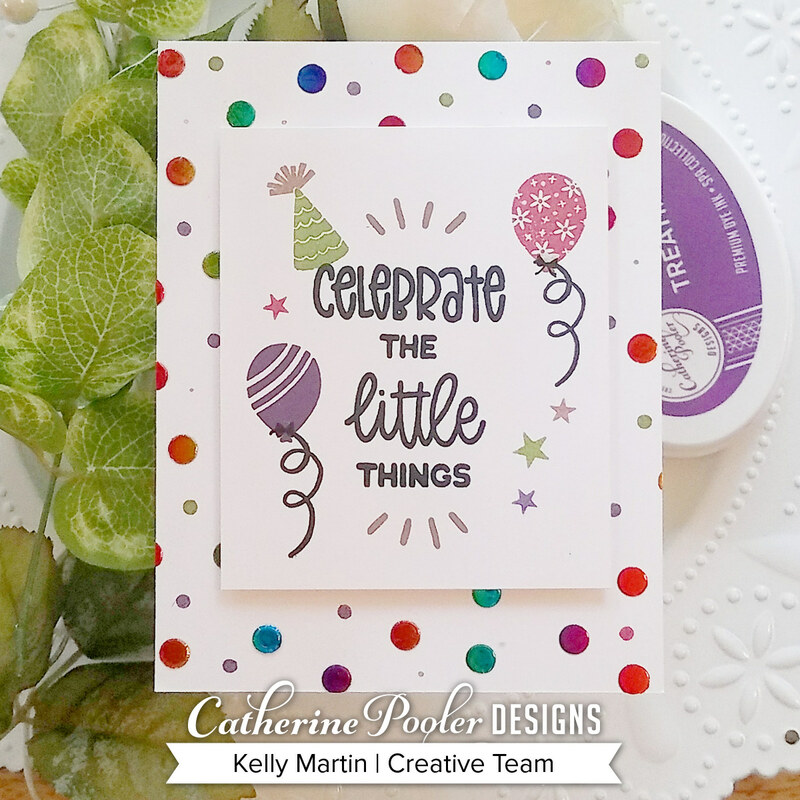 The scattered circles made a nice base card to pop your super cute sentiment to. Super cute tea card! I love how you made the sweet die cuts look like a lace table cloth. Thanks for sharing your really cute cards! I love the foiling with the dot stencil. 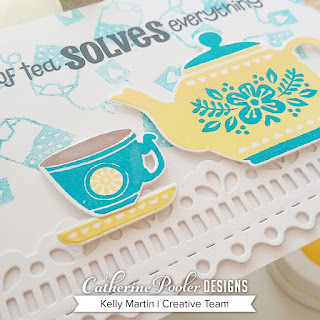 I love the color combo of the yellow and turquoise for your tea pot card, it's so pretty! My favorite part is the wonderful foiled dot background! Really cute cards. Love all the new stamps, dies & especially that new dotted stencils. A great new SOA collection. The border die is just the right amount of frilly for me. I can't decide between coffee or tea yet. Such gorgeous cards! Love this SOA collection! Lovely cards Kelly. I love how you joined the 2 border dies on the last card! Amazing! Oh wow, love that foiled background on your first card! And I can't see enough of that teapot and coordinating border dies! Great cards! Love the foil dots on your first card and your double border on the second card! Love the foil dots! I've not tried foiling yet, but I could see doing some embossed dots in different colors! Fun! The dotted background is amazing and I love the blue and yellow combo for the tea set! Your cards are lovely Kelly. I especially like the yellow tea pot. Now I want a cuppa tea. Wow, what wonderful cards. The foiled dots are super fun. Thanks for sharing your talents. I love them ALL. Great kit. I love the bold and colorful birthday card. The extra flair is wonderful. Thank you for sharing. I like your cards. I've never tried foiling. Great cards. The yellow and blue teapot is so pretty!